How many calories in a banana and what is the quality of those calories? How should the banana be prepared? There are about 118 calories in an average size banana. The quality of the calories in a banana is excellent if the banana is eaten raw. Yes, you should eat the banana raw. Much of the vitamins and pytochemicals will be destroyed if the banana is cooked. For example a banana is a good source of vitamin C in the raw form, but much of this vitamin is lost when the banana is cooked. Suggestions: Just because a banana is really good for you does not mean that you should eat as many as you want. When it comes to these water soluble phytochemicals and vitamin C, once the body gets enough, it excretes the rest. They cannot be saved in the body forever. Why eat more than one banana? If you really love bananas, it is better to eat one in the morning and one in the evening than it is to eat two bananas at once. I like a banana with peanut butter for breakfast, and a banana with one melted dove chocolate for dessert at super. Another factor to think about is will the calories in the banana fill you up? How long will it be before you get hungry? 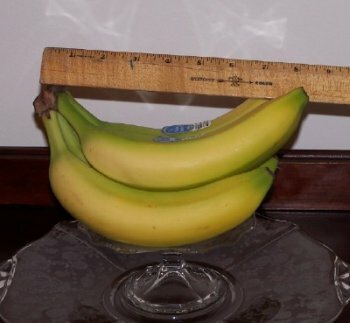 Considering how few calories there are, the food of one banana will last awhile. Both the little bit of fiber and the water will fill you up and stay with you for a little while, but you must be cautious because like most fruits bananas are high in sugar and so they will not fill you up for long. For breakfast when you have time, an egg and a piece of whole wheat bread will last longer. Do not want a plain banana. Try slicing sprinkling it with a bit of cinnamon. You could even add a half a teaspoon of sugar to make it a desert. Other easy toppings include: caramel, cheese, almond butter, chocolate, and yougurt. 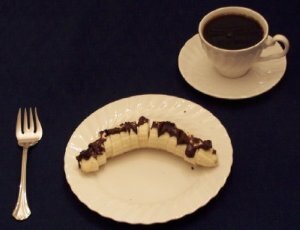 This is a very simple healthy banana dessert recipe. Step 2. Squeeze onto banana. Hot pad needed. Do you have a simple recipe you would like to share? 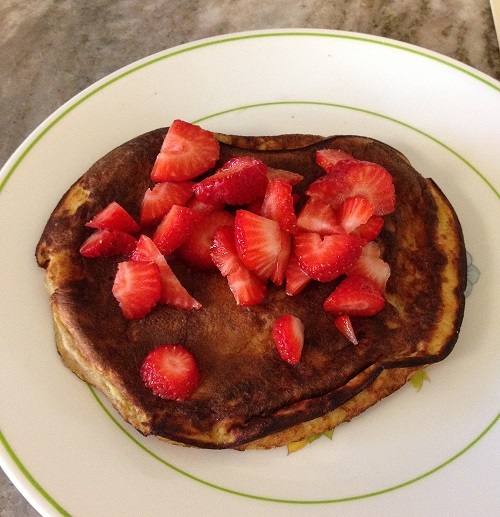 A great way to start your day at only about 250 calories. It makes one huge pancake and it needs no extra sugar. Return to Calories in Fruit.